It is looking increasingly more possible that we will see tropical development in the northwestern Caribbean as we get into the middle and later parts of next week. All of the most recent data suggests that this will occur and it is something that we are going to have to really watch. In addition to this, the latest forecast guidance are pointing towards a track that would take this system into the eastern Gulf of Mexico next weekend. Looking at the latest model guidance – All of the major global model guidance are now showing tropical development in the northwestern Caribbean in about a week from now. These models include the GFS model, the Canadian model and the European model guidance. Given the overall weather pattern that I am expecting for next week, I think the guidance are starting to really latch onto the tropical development idea and it may be correct in this thinking. The GFS model guidance has been the most consistent in showing tropical development and is currently forecasting that low pressure will initially develop over the southwestern Caribbean early next week that slowly moves north-northwestward reaching the northwestern Caribbean by about next Thursday. From there, the GFS model guidance forecasts this system to move into the eastern Gulf of Mexico by next Friday and next Saturday. 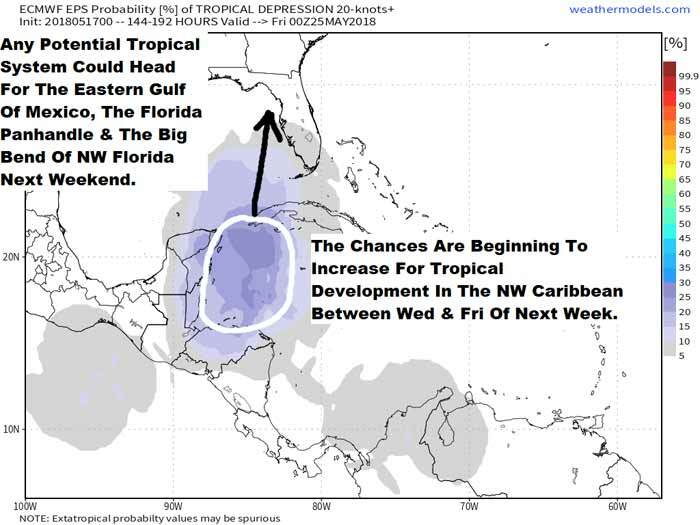 The Canadian model guidance forecasts tropical development to occur in the northwestern Caribbean next Thursday and next Friday that moves into the southeastern Gulf of Mexico and then across central and south Florida next weekend. The European model guidance seems to indicate that tropical development may begin to occur by about Wednesday of next week that crosses westernmost Cuba as a tropical storm next Friday. From there, the European model guidance forecasts this system to move into the southeastern and eastern Gulf of Mexico as a tropical storm next Saturday that approaches the eastern Florida Panhandle and the Big Bend area of northwestern Florida next Saturday night and next Sunday. This type of track would bring heavy rain and winds of up to tropical storm force to a large part of the Florida Peninsula starting next Friday and continuing into next weekend. The multi-model (GFS, Canadian and European) ensemble tropical cyclone genesis probability charts currently forecast a 30-40 percent chance for tropical development in the northwestern Caribbean during the middle and later parts of next week. The European ensemble tropical cyclone genesis probability charts indicate a 25-30 percent chance for tropical development in the northwestern Caribbean during the middle and later parts of next week. Here Are My Thoughts: I think that we really need to pay attention for the potential of northwestern Caribbean tropical development during the middle and later parts of next week. As I have mentioned in previous discussions, the overall weather pattern is expected to be favorable for tropical development with a upper level ridge of high pressure over the western Atlantic and low pressure over the western half of the Caribbean. In addition, a ribbon of very strong wind shear that is currently invading the Caribbean is forecast to lift northward next week creating a favorable low shear environment over the northwestern Caribbean. At this point, I think that there is about a 20 percent chance for tropical development in the northwestern Caribbean between Wednesday and Friday of next week. I envision a track that brings a potential tropical storm from the northwestern Caribbean next Thursday and next Friday through the eastern Gulf of Mexico next Saturday. 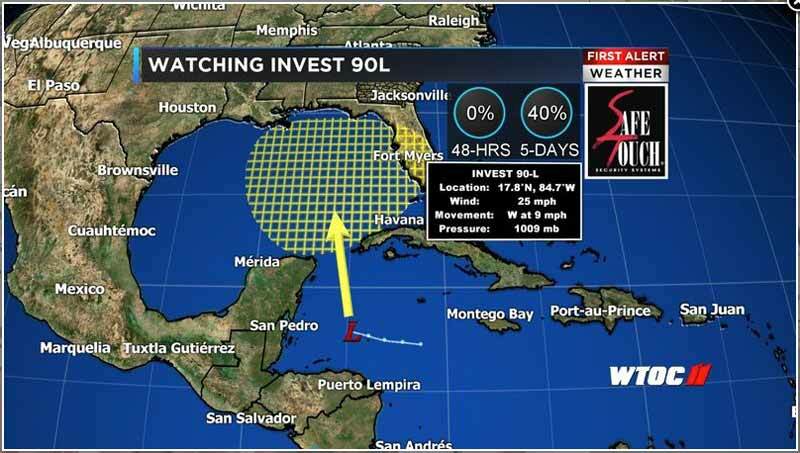 This potential tropical storm, I think, may make landfall in the Florida Panhandle or the Big Bend area of northwestern Florida sometime next weekend. This is a favored storm track this time of year and based on all of the latest data, it is the type of track that seems most possible right now. If we do see a storm track like this, then much of the Florida Peninsula would see another round of heavy rainfall and flooding concerns late next week through next weekend. In addition, severe weather and tornadoes would also be a concern across the Florida Peninsula next weekend. In addition to this, there will be heavy rainfall and storminess across the westernmost part of the Caribbean starting this weekend and continuing through next week. This heavy rainfall and storminess is expected to impact much of Nicaragua, Honduras, Guatemala, Belize and the Yucatan Peninsula. There has been some changes with our thoughts regarding tropical development later this week. The first change in thinking is that it appears that any tropical development looks to occur in the southern and central Gulf of Mexico late this week rather than the northwestern Caribbean. The second change in thinking is that whatever tropical system that does form in the Gulf of Mexico looks to head for the northern US Gulf Coast between Louisiana and the Florida Panhandle this weekend. This is a change from our previous thinking, which was a track into the eastern Gulf of Mexico and inland over the Big Bend area of northwest Florida or the eastern Florida Panhandle. Weather analysis this morning indicates that there is a upper level trough of low pressure that extends across the eastern Gulf of Mexico and the western Caribbean. This trough of low pressure is producing thunderstorm activity that stretches from the southwestern Caribbean northward through central Cuba to coastal parts of southeastern Florida. The deepest convection is currently found across the southwestern Caribbean in the area between Jamaica and eastern Nicaragua. In addition, weather analysis indicates that there is a westward moving tropical wave that is located very near the southern Lesser Antilles. It is expected that this tropical wave will reach the central Caribbean by Tuesday evening and the western Caribbean by about Wednesday night or Thursday morning. I think that this tropical wave will be the kicker to get a tropical disturbance going in the northwestern Caribbean that moves into the southern Gulf of Mexico late this week. I think that what's going to happen over the next couple of days or so is that the tropical wave now near the southern Lesser Antilles will reach the western Caribbean by late Wednesday or Thursday. This will help the southern end of the trough of low pressure that is over the southwestern Caribbean now by giving it a “kick” and setting off an area of disturbed weather that will be moving into northwestern Caribbean and the southern Gulf of Mexico on Wednesday into Thursday. A broad surface low pressure area has formed over the northwestern Caribbean Sea a couple of hundred miles east of the coast of Belize. This low and an upper-level trough are producing widespread cloudiness and showers extending from the northwestern Caribbean Sea across Cuba and the Florida peninsula. While environmental conditions are expected to be unfavorable for development during the next couple of days, some gradual subtropical or tropical development is possible later this week while the system moves slowly northward into the central or eastern Gulf of Mexico. Regardless of development, locally heavy rainfall is possible across western Cuba and much of Florida during the next several days. There has been a slight increase in organization over the past day to the area of disturbed weather (90L) associated with a broad surface low centered near the northeast coast of Belize in the western Caribbean. 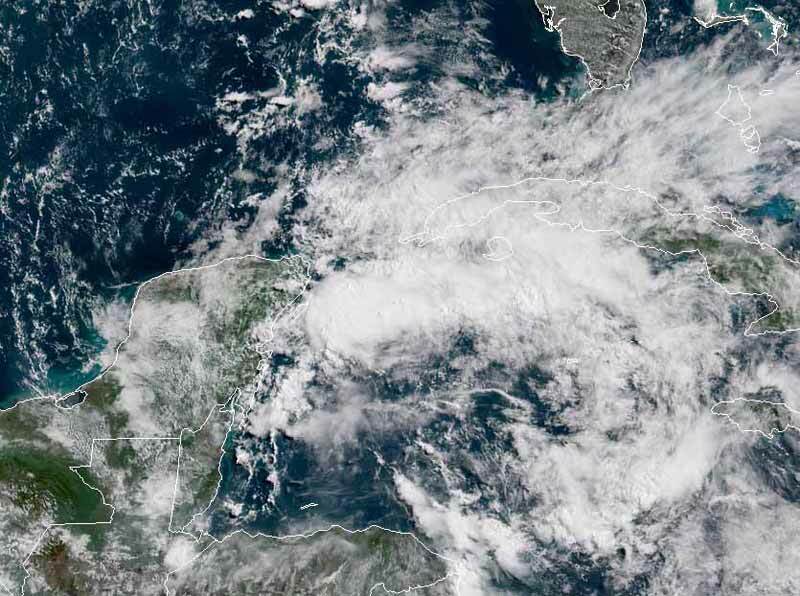 This system was spreading showers and thunderstorms over Cuba, Mexico’s Yucatan Peninsula, the Cayman Islands and Florida Straits on Wednesday afternoon. The 0Z Wednesday operational runs of our top three models for predicting tropical cyclone genesis--the European, GFS and UKMET models--all showed some weak development of 90L, but differed in the timing and location of development. The European model predicted that a tropical depression would form by Saturday in the central Gulf of Mexico, then make landfall by Sunday night over Louisiana. The 0Z and 6Z Wednesday operational runs of the GFS model showed development very close to Florida on Sunday morning, with the system moving northward into Georgia by Sunday night. The 0Z Wednesday run of the UKMET model predicted that development near the Florida Keys on Sunday, with the system tracking northwards a few hundred miles west of the west coast of Florida, making landfall in the Florida Panhandle on Tuesday.